With the failure of J B Johnson's attempt on the English Channel, interest in the possibility of a successful crossing grew. By the middle of the '70s, it had reached fever pitch and another attempt was soon to be made. This time the swimmer was Matthew Webb or, as he was more commonly styled, Captain Webb. Webb had read of Johnson's earlier attempt and obviously felt that he could succeed where his predecessor had failed. At the time, Webb was serving as captain of the steamship Emerald. We thought very little of him as a swimmer but admired his staying power. He could swim about for an hour without putting his foot to the floor, although in a race he was nowhere. The water apparently held no fear for him and even as a trainee, as Watson points out, he won a silver pencil for rescuing another boy who had fallen overboard. Rescuing, or at least attempting to rescue, people from drowning was to have a significant impact on Webb's life. 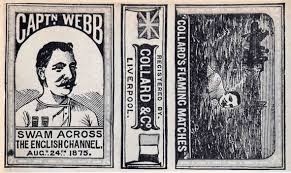 In 1873, as second mate aboard the Cunard Ship, Russia, travelling from New York to Liverpool the 25 year old Webb jumped overboard in an attempt to rescue a seaman who had fallen from the rigging. Unfortunately, the sailor was not seen again and only his cap was recovered. After half-an-hour in the water, Webb was brought back on board the steamer. For his bravery he was awarded both the silver medal of the Royal Humane Society and its newly created Stanhope Medal. Sadly, in 1989, all of Webb's medals, including the Stanhope and the Royal Humane Society Medal were sold at auction to a private collector for £12,650. 5 ft. 8 in. high, measured 43 in. round the chest, and weighed about fourteen and a half stone. ...During his training he once swam out to the north-east Varne Buoy, which is more than half-way across the Channel, and also from Dover to Ramsgate, about eighteen miles, in 8 hrs. 45 mins., as well as in the Thames from Blackwall to Gravesend in 4 hrs. 52 mins. The Channel attempt was widely covered in the newspapers of the day with many of them relaying reports from their local correspondents. At just before five in the evening, Webb was liberally coated in a yellow fatty oil obtained from porpoises. Fair weather and calm seas were expected and at just a minute or two before five the swimmer entered the water. According to the London Daily News, "he commenced his journey amid a round of cheers." Despite expectations of fine weather, a breeze had sprung up and the water was beginning to roughen. Webb set off briskly, covering the first quarter mile in ten minutes using a breast stroke, but the weather began to turn and just before midnight, after swimming about thirteen and a half miles in just over 6 hours and 48 minutes and despite feeling "warm and quite well," he decided not to continue saying that "it was impossible for any mortal man to swim as far again in such a sea." According to The Times, in the opinion of those accompanying him, "had the weather been fine he would have succeeded in reaching the French coast." Webb and his team watched the weather carefully and planned another assault on the Channel. Monday, 23 August looked good for a midnight departure but the weather forced a further delay until the following day. 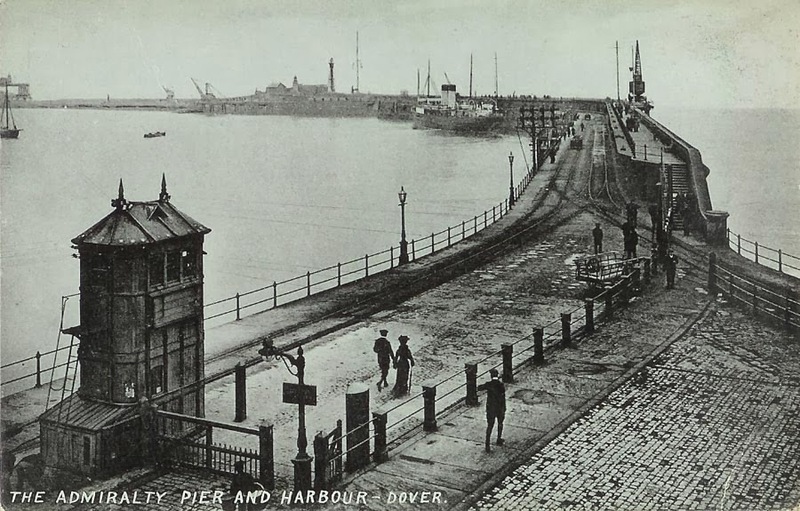 At just before one in the afternoon, Webb dived from the end of Admiralty Pier and headed for France. Using his slow breast stroke, he made such progress that the lugger which accompanies him across as before, although it had all sail set, had to put out oars and row to keep up with him. Two rowing-boats follow him with the referees and a young man who is ready at any moment to plunge into the sea to render Captain Webb any assistance he may require. Exhausted, delirious, his face encrusted with salt, one eye blind from the waves, his body rigid and greasy like a lump of cold wax, Webb stood, stumbled and fell, lifeless, into the waiting arms of his friends. he considered it very important that more people should be able to swim than at present: and if in swimming across the Channel he had caused people to think more of teaching their boys to swim he should be well satisfied with what he had done. It didn't take long for the enterprising book market to cash in on Webb's fame. 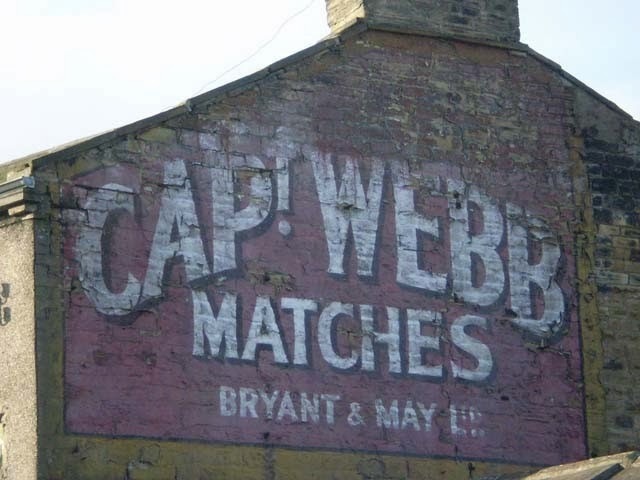 Within days The Channel Feats of Captain Webb and Captain Boynton was on the market. Only 64 pages in length, it featured "a dashing picture of Captain Webb bravely breasting his way across the Channel." Reviewed in The Penny Illustrated Paper and Illustrated Times of 11 September 1875, it was described as a "seasonal little book" and one which "provides the reader with a complete account ... as well as a brief memoir of Webb and Boynton." Webb's face was soon well known throughout the length and breadth of the land. Here was a real hero, a conqueror of the most elemental forces. 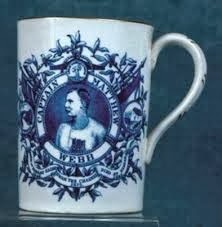 His image appeared on mugs and cups, on matchboxes and other innumerable forms of ephemera. As if that was not enough, advertisements featuring his image appeared on walls and song sheets praising his valour and his accomplishments were available. The chorus to the 1875 song, "Captain Matthew Webb or Swimming from England to France," seemed to capture the public approbation engendered by the feat. For the next few years Webb was in and out of the news. Various swimming exhibitions and competitions both in England and in the United States either failed to materialize or were less satisfactory than the swimmer might have wished. finally, in July of 1883, just short of eight years after his magnificent Channel crossing, he made one final attempt to regain the stature he so desired. For a fee of $10,000 he undertook to swim the rapids and whirlpool at Niagara Falls. The funds were put up by various railway companies in the hope that such an attraction would draw crowds to the scene requiring them to run special trains. on entering the rapids [he] was almost turned over by the force of the water. He swam the rapids, however with great determination, being now and again caught sight of by a few of the spectators. When last seen he was entering the whirlpool, and at first appeared to be doing well, but very shortly afterwards threw up his arms and disappeared. When Queen Victoria heard the news, she wrote in her Journal on the 27th of July, "the celebrated swimmer, Capt: Webb was drowned while trying to swim across the rapids at Niagara, very shocking." The very next day, July 28th, His body was recovered from the river. It was Captain Webb's last swim. Despite his latter years, nobody would ever be able to take away from Matthew Webb the glory of having been the first to swim the English Channel. Over the years many others attempted to duplicate his feat, but it was not until 36 years later that Thomas William Burgess succeeded in swimming from Dover to Gris Nez in 22 hours and 35 minutes. In the years between the two successful swims, there had been more than eighty attempts; all of which ended in failure. Certainly for the 36 years between Burgess's and Webb's crossings, the Badminton Library's volume on Swimming was not wrong when it said Webb's triumph was "the greatest authenticated long-distance swim in the sea without any artificial aid." 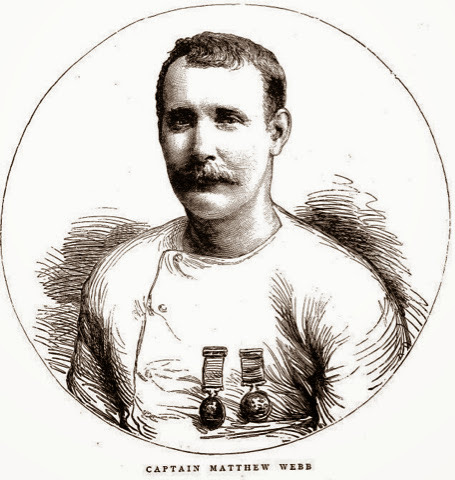 While Captain Webb may have faded from popular memory, only to be known to Channel swimmers and historians, he did manage to reappear from time to time. In 1940, John Betjeman (later to be appointed Poet Laureate by Queen Elizabeth II) wrote "A Shropshire Lad," in which he has Webb's ghost swimming back to his home in Dawley along the canal. In a completely different context, the American cartoonist and creator of the comic strip, "Pogo," Walt Kelly briefly paid tribute to the swimmer in his strip in 1968. 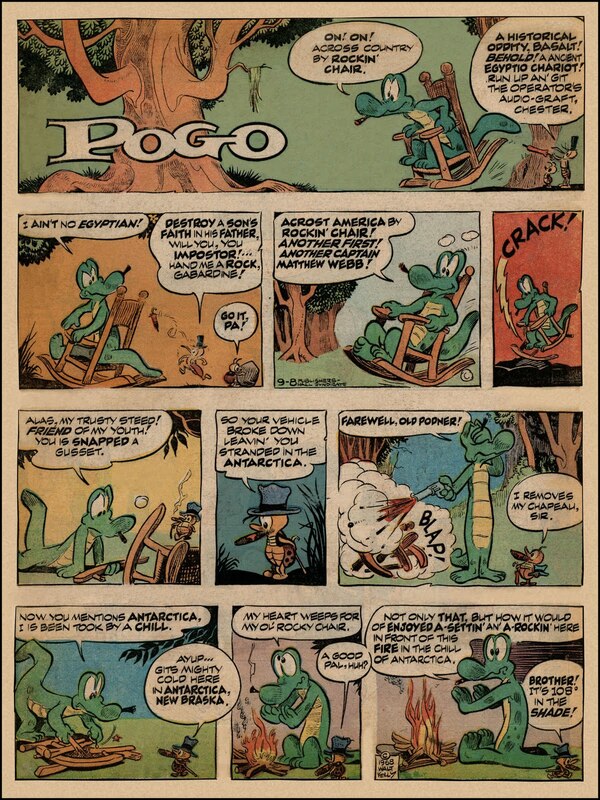 The full "Pogo" comic strip can be seen by clicking here. To hear "Tom O'Bedlam's reading of John Betjeman's "A Shropshire Lad," click here. With the growth of leisure time in the later years of Victoria's reign, the variety of sports both for participants and spectators grew rapidly. Men and women competed against time, the elements and one-another. Much was conquered but much remained and in 1870 the English Channel retained its mystique and its reputation as being unconquerable - at least by swimmers. There was something special about this fascinating body of water. It was, after all, what divided England from the European continent and was, to use William Shakespeare's image, part of "a moat defensive to a house/Against the envy of less happier lands." The English Channel had always been part of the great defensive net around England and while it was regularly crossed by boat, experience had shown that it was a bulwark against invasion. But by the last quarter of the nineteenth century it was becoming easier to cross. The first balloon passage took place as early as January of 1785 when Jean-Pierre Blanchard, with the American, Dr. John Jeffries, navigated from England to France in about 2½ hours. Thirty years later, in March of 1815, the steamship Élise in a harrowing seventeen hour crossing conquered the Channel for steam. But it was not until 1872 that the first recorded attempt to swim the English Channel took place. The swimmer, J B Johnson, lasted for only three minutes more than an hour before abandoning the effort. Johnson was a professional swimmer based in Leeds who came to prominence in 1871 when he won the swimming championship at the Welsh Harp Lake at Hendon in the teeth of a driving hailstorm and in front of a crowd of three or four hundred spectators. The Times described him, at the time, as "undoubtedly the best swimmer [in] England." 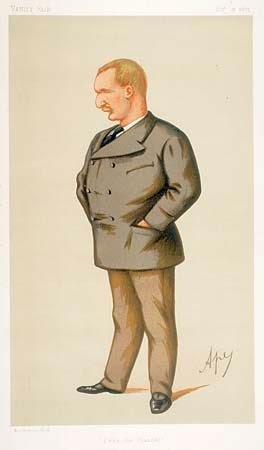 Johnson had already attracted some interest and attention in the press when, a few days earlier, he had leapt from London Bridge apparently to rescue a gentleman who had fallen from a Thames Steamer. According to The Badminton Library volume on Swimming, this "afterwards turned out to be a mere exhibition. Johnson dived to rescue a drowning person, the said 'drowning person' being his brother Peter, who was nearly as good a swimmer as the famous J. B., and a capital stayer under water." In August of the following year, Johnson attempted to swim the English Channel. He clearly realised the value of publicity and a few days before his attempt had posted placards around Dover from where the swim was to originate. 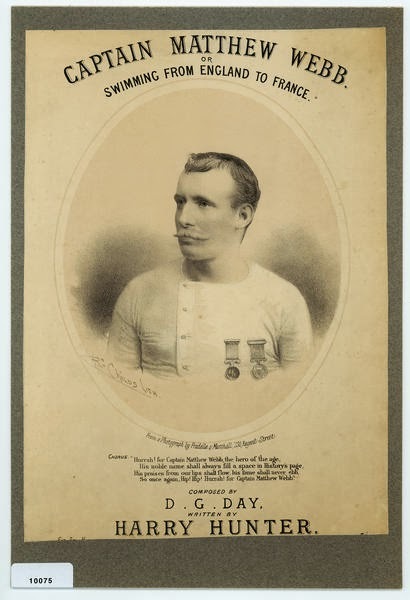 The placards announced that the "hero of London-bridge and champion swimmer of the world" would swim from England to France. Such a feat was generally deemed to be impossible, although there were stories of three escaped French political prisoners attempting to swim to England. Two were supposed to have completed the swim, one of whom died almost immediately thereafter while the other survived and lived in Dover for a number of years. But the attempt by Johnson was not to be one of rumor or half-truth; it would be thoroughly documented. At the time, Johnson was twenty-four years old and a superb physical specimen as well as being captain of the prestigious Serpentine (swimming) Club in London. Johnson's attempt came about as a result of a bet placed in Leeds, his home town, at odds of 1000 pounds to 30 pounds, a wager which was quickly doubled. Having already made his mark as a swimmer, he must have realised that a successful crossing of the Channel would raise him even further in the eyes of both the public and the swimming fraternity. Always aware of the power of publicity, in addition to the placards which had been placed around Dover, Johnson hired the brass band of the Royal Surrey Zoological Gardens to play at the start of his swim. A steamer, the Palmerston, was engaged to accompany him. He was cheered by a crowd estimated by the Times's correspondent at thousands when he dove into the water from the steamer at 10:40 am on Saturday, 24 August. After an hour, however, it became clear he would be unable to go on. He took some port wine at 11:20 and again at 11:30 while still in the water, but by 11:45 he was out of the water and on the deck of the steamer. According to the Times, when he was pulled aboard, his legs were numb from the thighs down and he was suffering from hypothermia to such a degree he was even unable to drink some of the beef-tea which was proferred. Nonetheless, always the showman, when the Palmerston arrived at Calais at 3:00 pm, he, and his brother who was accompanying him, "dived into the water, one from each side of the boat, and delighted the spectators anxiously awaiting his arrival with various specimens of aquatic skill." While perhaps not achieving the fame he sought, Johnson certainly was the subject of much adulation. Despite his failed attempt at the Channel, a popular song, "I wish that I could swim like J. B. Johnson, was soon being heard. The task seem'd easy unto him. To go right to Australia. Two of the verses refer to his feat at London Bridge and his failed attempt on the Channel, neither of which seemed to, in any way, to lower his popular appeal. But it was not until three years later that the English Channel was finally conquered, not by J. B. Johnson, but by Captain Matthew Webb. To see the whole song, I wish that I could swim like J. B. Johnson, click here.